Oh, and I might have definitely downloaded the original Catfish documentary and watched it too…DON’T JUDGE. So. What exactly is a “catfish”? Well, according to the original documentary, catfish used to be packed into shipping containers with other live fish to help keep the live fish alive during shipping. As one man in the Catfish movie said, he’s grateful for the catfish in life because it would be dull and boring without a fish nipping at your toes. So a “catfish” is a person who keeps you on your toes. A catfish is a person who pretends to be someone else online, usually for the purpose of entering into an online romantic relationship. Like, say, what happened to Manti Te’O. So what fascinates me about Catfish? Some of these people are in year-long relationships with people they have never ever laid eyes on in real life before…like, ever. I mean, I suppose its the modern day equivalent of being pen pals with someone…but lets be real. “I don’t have Skype” just doesn’t cut it anymore. It’s not like this is the age of AOL. Do a Google search image search people! Or just a basic Google search. Ask my mother—she’ll tell you it’s the first thing you do when you (or in her case her daughter) starts dating someone. Are the people getting scammed really this naive and they don’t google? Or, am I just always thinking the worst? That there are actually people who are crazy enough to catfish someone. 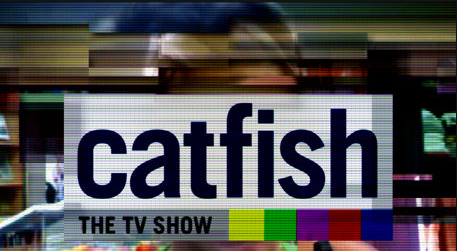 Every time I watch the show, and the person on it has something insane like 32 fake online profiles, all I think is, “do people like this really exist?” Catfishing someone is just so…wrong. The people who get scammed on the show are so…likeable and endearing and I always really want it to work out for them…but then I think to bullets 1&2 above and I’m like “get smart people!”…and you know the bad ending is always coming but you can’t stop watching. The first season of Catfish has ended, but you can watch all the episodes online…perfect for a Catfish marathon. Categories Friday Find, life as we know it. Its come to my attention that I tend to rant (and never rave) about dating. And before anyone gets confused and thinks I’m just super high-maintenance and impossible to please…I’d like to present evidence from what I consider a really good date, circa summer 2012. Cheerwine cherry soda. 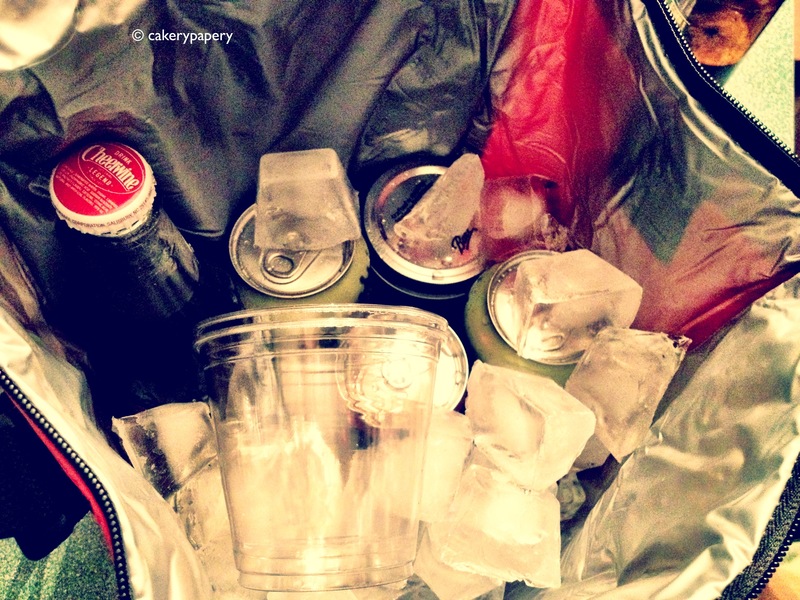 Some ginger ale. Mini mason jars full of booze, and two cups. Add in a hike up to the top of Cobbs Hill to sit at the reservoir, a chance to look at the city, have great conversation, and stare at the stars. I’m putting a mark in the “win” column. And it didn’t even involve parking. It’s the nice guys that get you, EVERY TIME. They start out all nice and normal and romantic, and then you wake up one day and they do something super classy like call it off over text message. He is on to what’s “next!” because I didn’t offer to pay for parking. Oh, and I found out via his FB status update. So while I’m asleep dreaming of the next date, he’s posting the “she didn’t even fake offer to pay for parking, next!” to FB, knowing that I’ll likely see it the next morning. Almost as good as the time I was broken up with via FB relationship-status change…NOT JOKING HERE EITHER. PARKING. IT WAS THE SECOND DATE. Are you sh*tting me, life? Do you want the girl that pays for parking, or the girl you have a really awesome connection with and can’t stop thinking about? I like to think it’s the second, especially since you talked about how awesome it is that I’m career driven, I volunteer all over the city, and I look great in a mini skirt. Oh, and there were the multiple ‘thinking about you,’ ‘can’t wait to see you,’ ‘daydreaming about you’ text messages I received. I offered to pick up the rest of dinner, which, btw, you paid for with A GIFT CARD. And, when you refused, I acknowledged that you had paid the first and second date. Which, if you remember from the multiple cupcakes and brownies and beers I had brought to your house in the past because we actually never went on a date, just watched movies, was probably a sign that I was going to do something nice for you in return. Now, I know the remaining $5 on the dinner bill plus tip isn’t the same as the $7.50 that parking cost, but if you’re looking for the arbitrary “fake attempt” to pay, pretty sure it happened. Also, you DO NOT purposefully play the obscure band that we both like on the ride home from dinner, give me an amazing kiss goodnight, and tell me you will see me again soon if you are planning to post about parking on FB. THIS IS NOT OKAY. Are you really willing to write me off so quickly without even allowing me the opportunity to do something nice for you in return? Sorry for draining your bank account over the course of two dates. So while you’re bemoaning the two dates we went on which you claimed were amazing, I’ll be doing something really amazing for someone who will actually appreciate it. It was the second date. I’m generally on my best behavior (which, apparently, doesn’t include paying for parking) on the second date because I’d like to go on a third one. SECOND. DATE. As my y-chromosome enabled friends have informed me, dates 1 through 5 are supposed to be amazing so I want to keep dating you. They also think paying for parking is a “man” thing and that I just dodged a bullet. Oh, and btw buddy, you just posted on your FB wall about how cheap you are, so good luck the next time you try dating. Categories are you sh*tting me life? To say you were, well, disappointing, would be an understatement. More specifically, I’ll say my 2012 dating life blew goats. We started the year off with the “you overwhelm me” guy. We went to dinner with Mr. Wrong…more than once…shame rattle. And I was a bit of a good luck charm. Which culminated in my college bf getting married and my dad telling me I “missed the boat.” Bridget Jones much? I received THIS in the mail. And THIS over email. We laughed a bit with the “I’m trying to have a creepy airport hookup in the sky lounge” guy. And I was righteously angry at the “I’m ending it over text message less than 24 hours after telling you I really like you” guy. 2012 was a Bridget Jones meets a Taylor Swift song. But I have high hopes for 2013. So I’m making some relationship resolutions. Read the writing on the wall. If you think things aren’t working, they probably aren’t. So walk away. It takes a lot of walk away, because you keep thinking that the other person will change or things will get better or it will be different in the new year. I’ve stayed in relationships for too long (and probably too many tear-filled phone calls to girlfriends) because I wasn’t willing to admit that I wasn’t happy and things weren’t working out. So read it, believe it, and act on it. Keep taking chances. It’s a rough world out there, and it takes a lot to keep putting yourself out there. Some days it will feel like you are feeding yourself to the wolves. But keep doing it. I haven’t found the right person yet, but I’ve learned a lot about what I like and what I don’t like, and about what goes on the dating bill of rights. So keep taking chances. Don’t recycle. If it didn’t work out the first time, there was probably a good reason. Don’t recycle relationships. It’s bad news bears. So good riddance to bad rubbish 2012, and get ready 2013, because it’s time to rock on. Watch out for the Nice Guys. It’s advice that your mom/best friend/sister/therapist/Bridget Jones probably never told you. But I’m letting you know. BEWARE of the nice guy. The nice guy is easy to fall for. He makes dinner reservations. He waits until you get inside the house before leaving. He asks about your day and is legitimately interested in hearing about it. He pulls out your chair, buys you flowers, and has a glass of wine waiting for you when you arrive. And not a glass of wine in the “I am making decisions for you and am trying to control you” way, but in the “I’m being thoughtful” way. The moment you find yourself thinking, “this is really nice” and “wow, I need to go to finishing school so I know what to do when he pulls the chair out next time” remind yourself of this: The nice guy is easy to fall for. I need to watch out. That way, when the nice guy calls it off with you over text message less than 48 hours after doing something amazingly sweet and less than 24 hours after telling you how much he likes you, you won’t be surprised. I’M WARNING YOU. Watch out. Also? “Hi!” is not an appropriate greeting for a let’s just quit while we are ahead text message. An exclamation point? Are you sh*tting me life? Didn’t realize you were THAT excited to be extracting yourself from my life. Beware. Of. The. Nice. Guy. Be careful out there ladies. Don’t let yourself fall for a Mr. Wrong. Keep your heart and your eyes open. WIDE OPEN. And watch out for the nice guys. This isn’t a ‘Dear John’ letter. It’s a Dear Dan letter. And it goes something like this. Thank you for making me feel like Eva Mendes. She’s well, you know, sort of my girl crush. Have you seen Hitch? Do you remember the scene in the bar, with the bad apple martini? It’s THAT Eva Mendes. So thank you, because I love Eva Mendes. I admire your persistence Dan. After I turned down your offer of a drink (three times), even though the bar was only a stone’s throw away and we had hours until the flight left, you just kept talking. And even after I told you I was seeing someone (huge dude, tons of muscles, in the mob, etc. ), you just kept talking. You offered me more wine. You asked me to share things about myself (I declined) and you overshared about yourself (gag). You asked me to meet up in Texas. I told you that I watch Criminal Minds and no, no thank you. You just wouldn’t take a hint. I was really enjoying my book Dan. Even when I blatantly did not close my iPad, did not fully remove my headphones, and openly texted my sister to emergency-911-avoid-the-crazies call me, you were still there. Talking. So thank you, for the compliment of coming over. Truly, thank you. But the next time you’ve had three glasses of wine and think its a good idea to talk to the girl reading a book with her headphones in sitting a few seats away in the airport lounge? Yeah…keep that idea to yourself. Because I didn’t have Will Smith hovering nearby to save me. Do you ever have those moments when someone says, “Yeah, it was like 10 years ago” and you think they mean the 90’s, when really they are referring to 2002? I received the following at my parents’ house last week. But this is not an ordinary letter. It is a gramatically incorrect, poorly punctuated, neatly typed, blast-from-the-past, super creepy LOVE LETTER. Don’t believe me? I’ve gleefully accurately transcribed it below. Names have been changed to protect the…innocent. Hey how are things going? I came across your address on something a little bit back and thought I’d write you and say hi. Well right after that I was out for a jog and was hit by a F150 Pick-up truck. Broke 10 ribs puntured lung few other things, Nothing really physically noticeable, incredibly lucky for getting struck at what the driver said he was going 50MPH and threw me into a tree. Going back to work today for a couple weeks then surgery on my ribs. Anyways, how have things been? What are you doing these days? I’m still doing the police ting and own a few houses. Starting a new business I think soon. Think I’m going to build a house soon, Have a lot of plans for it just have to find the location I want it. What is new with you? I think the last time I saw you was at Nathanial’s the summer you were working at red wings stadium. You still living in NYS. Sent this to your parents hoping they could forward it to you. How is your family? Lol I remember being over your house after class a couple times and your dad came home and I was all intimidated lol. We were young then eh? Okay, I know what you are all thinking. Give this guy a break, he’s just trying to be nice, etc etc. First, a letter to my parents’ house? A letter? What is this, 1990? And ten years later? There are MANY MANY ways to find my contact info…LIKE GOOGLE. Or LinkedIn, Facebook, Twitter…the list goes on. And the fact that he still has my address memorized is just…creepy. Second, can we discuss the punctuation? And grammar? I work in communications for a living. Good grammar is like breakfast cereal to me. I’d just like to say, the capitals after the commas…SO CONFUSED. And no question mark after the question about living in NYS is just…wrong. Third, the phrase “LOL” should never be used outside of text message. And the “eh?” I’m all for celebrating my Canadian heritage, but wtf. And he was hit by a pickup truck??? And owns a “few” houses? Are you sh*tting me life? Don’t even get me started on the ones who say they plan to “start a new business.” UGH times TEN. 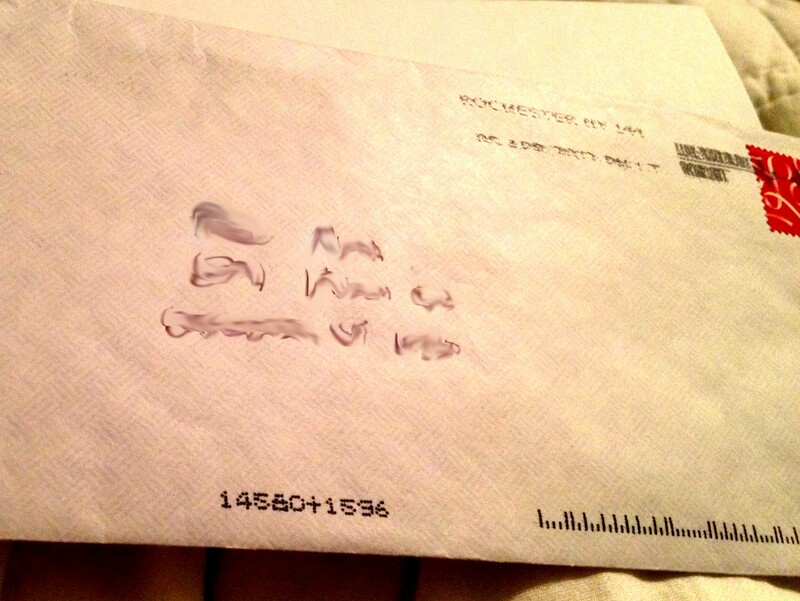 AND BEFORE YOU CALL ME JUDGY MCJUDGERSON…which I might be…I’D LIKE TO POINT OUT THE STAMP. 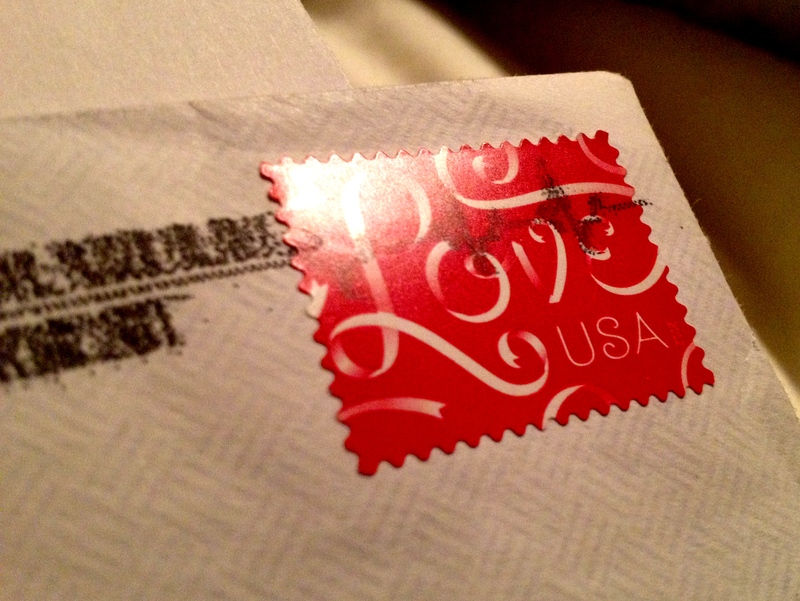 What grown man has a stash of “Love” stamps just hanging around the house? Flag stamps, Liberty Bell stamps, even leftover Christmas or a wedding stamp would have been better. But a “LOVE” stamp? I’m pretty sure this stamp was…intentional. And therefore creepy. VOMS. Overall, the only redeeming facet of the letter is its choice of font. A sans serif. Thank goodness for the little things in life. A for effort. And A+ for creep factor.